We often get questions here at Garrett’s about the things we can and cannot take in the moving truck. One kind of item that we feel gets overlooked by our customers is candles. Nearly everyone has at least one, and if you are like a lot of Americans, you have a whole collection of vanilla cupcake and banana nut bread scented candles adorning your home. Unfortunately, putting your candles in the moving truck puts them at serious risk. The cargo area of a moving truck is not air conditioned. This means they get HOT, especially during the summer. And all that heat will cause your candles to melt. Even if you aren’t moving in the summer, the smallest amount of heat can cause them to bend and warp. Needless to say, the safest thing to do is to take your candles in your personal vehicle for the move. 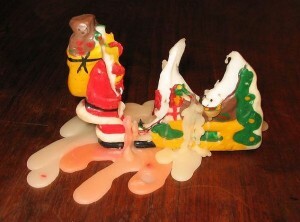 Even if your move is just across town, taking the candles in the car with you will reduce the chances of them breaking. Here are some tips for ensuring your candle collection gets to your new home safe and sound. Candles break easily. So unless you still have the original packaging, use bubble wrap and packing peanuts. Wrap each candle in bubble wrap. Fill your moving box with packing peanuts, then place your wrapped candles inside, filling in any extra gaps with more packing peanuts. *Moving Tip*: If you have a large cooler, you might want to consider using that as your candle moving box instead. When you are packing up your car, be sure and put your candle box in last. There are two reasons for this. First, putting your candle box on top of other boxes ensures that your candles won’t be crushed by boxes on top. Second, putting your candle box in last limits the time that they will be exposed to the heat while your vehicle is sitting in the driveway. Of course, putting in your candle box last means you can unpack it first at your new home. If you have a particularly large candle collection, you may be thinking about shipping them, especially if you are moving cross-country. However, this can be risky because there is always a chance that your candles will end up sitting in a hot vehicle somewhere during the journey. We recommend going ahead and taking them in your personal vehicle to play it safe. Just be aware of any time you turn off your car and leave them in heat, such as when you take a break at a rest stop. Keeping your candle box in a shady spot and near an air conditioning vent will reduce the chances of them melting during your stops. If you have any other questions about moving your candles, or any other questions in general, feel free to give the team at Garrett’s Moving & Storage a call. You may also contact us via our quote request form. Simply include your question in the comments section, and we’ll be sure to get back to you with our best answer. We’ve done nationwide moves since 1992, beginning and ending at any location in the United States. Give us a shout-out on our Facebook page and we’ll get back to you ASAP.